Piglet is defined by his petite and flimsy frame. These physical qualities most likely contributes to his anxious, fragile, and insecure nature. Piglet often cowers in fear even when moments are unthreatening. Though his best friend, Pooh, and the others don't seem to mind Piglet's constant fears and happily brings him along and protects him through every adventure, Piglet is noticeably ashamed of his cowardliness, and many storylines have revolved ﻿around him making attempts to overcome his fears. It is quite clear that Piglet's timid, jittery, and hesitant qualities are grounds to diagnose him with Generalized Anxiety Disorder (GAD). Piglet's ﻿irrational anxiety causes him to suffer from a distinct stuttering speech impediment, stress, and general nervousness. Those with GAD worry endlessly and cannot be relaxed immediately, like Piglet. Symptoms of GAD that Piglet experiences are e﻿xcessive and ongoing worry and tension, an unrealistic view of problems, and being easily startled. Piglet often thinks of how any situation can go wrong and endures internal conflicts regarding what he should do in case a situation does go wrong. For example, while trying to find a heffalump (a creature that resembles an elephant) Piglet thinks to himself how he can fake a headache so he will not have to face one of these creatures, lest it is fierce. Then he worries if he fakes a headache, he will be stuck in bed all morning- which he wants to avoid. Scenarios like these usually make Piglet extremely anxious. Piglet's anxiety causes him to shake, blush, twitch, and get flustered. Piglet also has phobias of the dark, wind, heffalumps, being abandoned, etc. As defined by Mayo Clinic, "a phobia is an overwhelming and unreasonable fear of an object or situation that poses little real danger but provokes anxiety and avoidance." Piglet's fears are undeniably "overwhelming and unreasonable" because heffalumps, the dark, and the wind pose "little real danger" to Piglet, but does not seize to evoke anxiety in him. In a conversation with Owl, Piglet says "Oh Owl, I don't mean to c-c-complain, but I'm afraid, I'm scared." 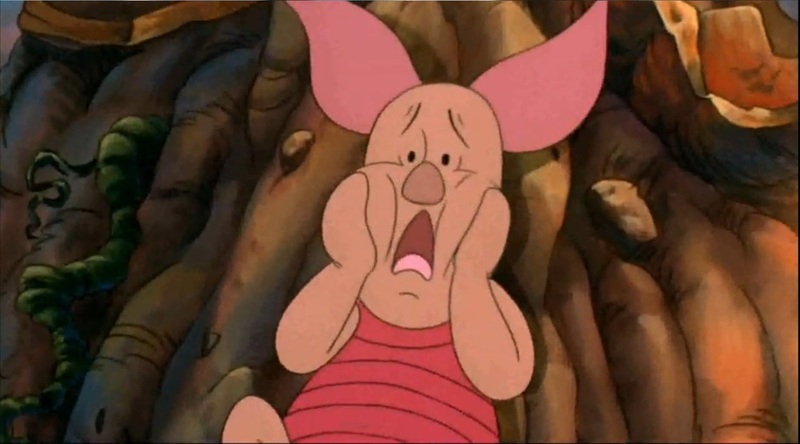 As portrayed, Piglet's anxiety causes him to stutter. Despite Piglet's worries, Owl confidently and faithfully replies, "Piglet, Chin up...A rescue's being thought of. Be brrrave, little Piglet!" Piglet attributes his cowardice to his little frame by responding: "It's awfully hard to be b-b-b-b-brave when you're such a small animal." Here, he begins to stutter more immensely and seems to be unable to overcome his fears despite Owl's assurance. Piglet undoubtedly suffers from Generalized Anxiety Disorder; and his character is developed through his anxious demeanor.